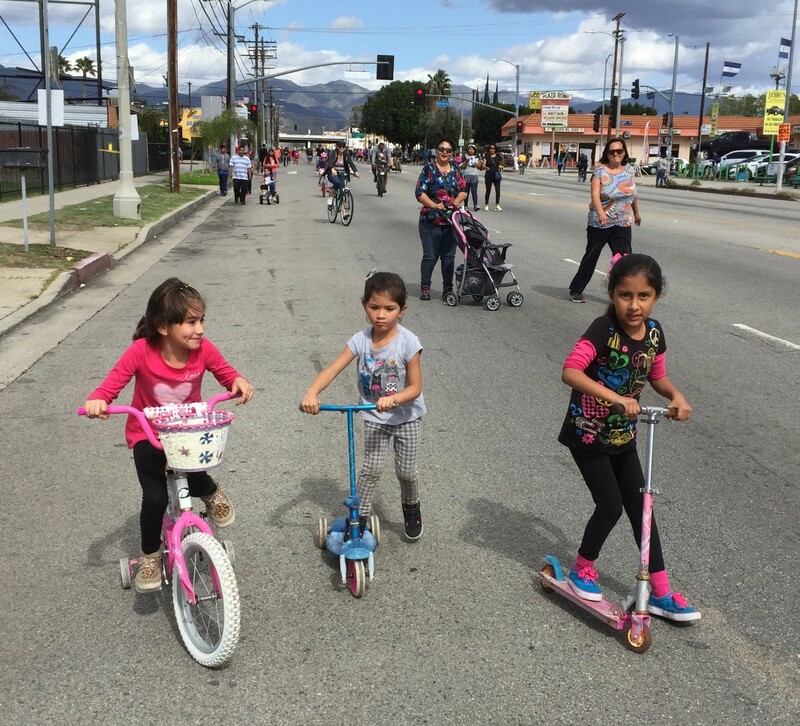 Kids take to the streets in Pacoima during yesterday’s CicLAvia. All photos Joe Linton/Streetsblog L.A.
Each open streets event is excellent, and each has its own variations. 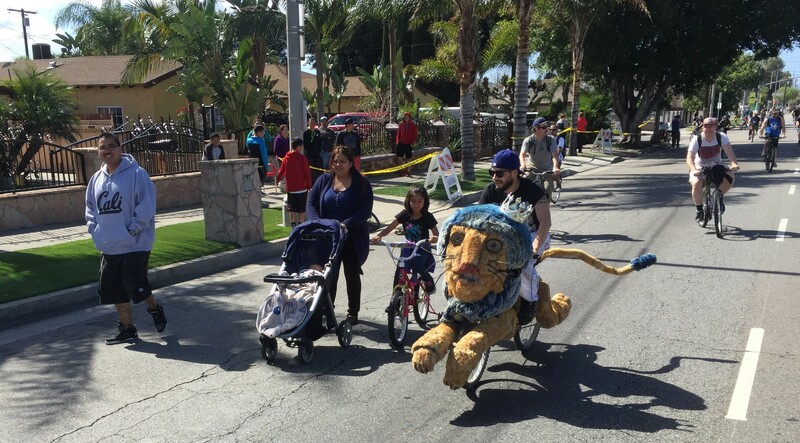 Yesterday, L.A.’s 16th CicLAvia touched down in the north San Fernando Valley communities of Pacoima, Arleta, and Panorama City. As I mentioned in a preview, this was the first CicLAvia without a Metro rail station on the route, though there were still plenty of ways to get there, including special Metrolink service. I would guesstimate that this “CicLAvia – The Valley” route looked perhaps 30 to 40 percent less crowded than a “Heart of Los Angeles” downtown L.A. CicLAvia. There were tens of thousands of people out enjoying themselves, but with a less central location combined with wider roadways, the crowds looked a bit thinner. What was fun, though, was that it looked like lots of neighbors made their way out into the streets. People hung out in front of apartment buildings, some on narrow lawns, some sitting on the curb. Families walked, strollered, scootered, and bicycled; there were lots of small girls and boys on bikes with training wheels, with parents walking behind. From tax preparers to restaurants, local businesses spilled out into the streets. 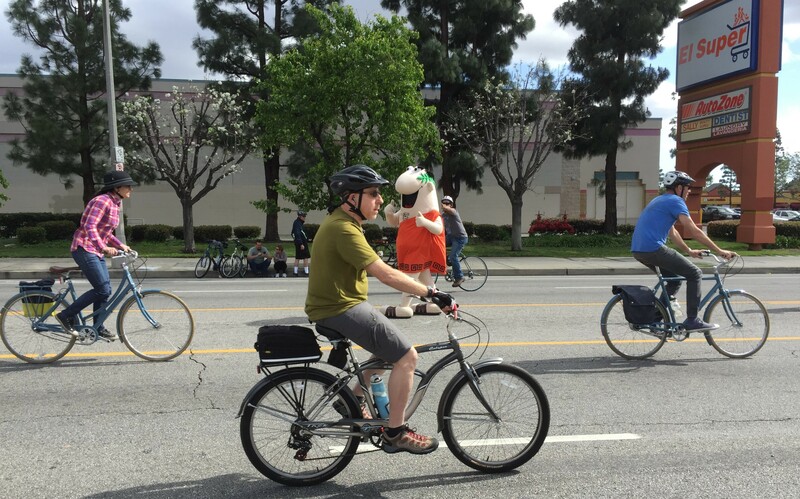 How was your CicLAvia day, readers? 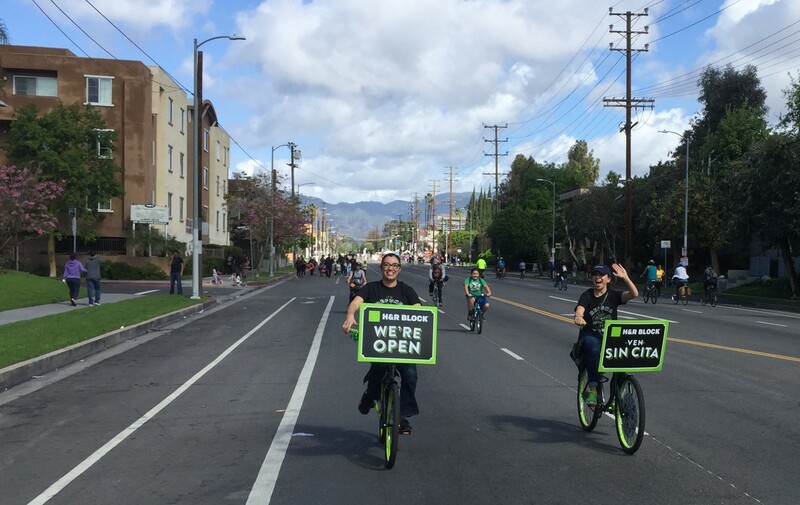 How did you get to yesterday’s CicLAvia? Let us know in the comments below. More photos (and upcoming open streets dates) after the jump. CicLAvia – The Valley saw lots of people on bikes and lots of families walking. Saturday, March 19: Beach Streets Downtown. The Downtown Long Beach route will feature the Broadway Corridor, Pine Ave., East Village Arts District and 4th Street Retro Row. Event Hours: 10 a.m. to 5 p.m. Closest Metro Station: 1st Street, Downtown Long Beach Metro Blue Line Stations. Route Length: 4 miles. More information here. 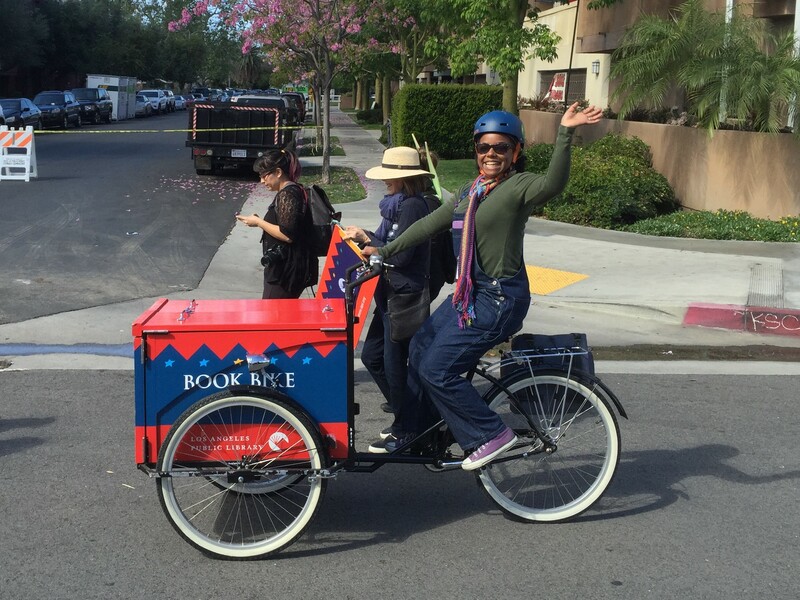 Saturday, April 23: Lawndale Community Bicycle Ride and Open Street Event presented by Metro. The route will include the intersection of Manhattan Beach Boulevard and Prairie Avenue and will traverse along Manhattan Beach Boulevard, Hawthorne Boulevard, Marine Avenue and Prairie Avenue. Event hours: 8 a.m. to 10 a.m. Closest Metro Station: Redondo Beach Metro Green Line Station. Route Length: 2.2 miles. More information here. 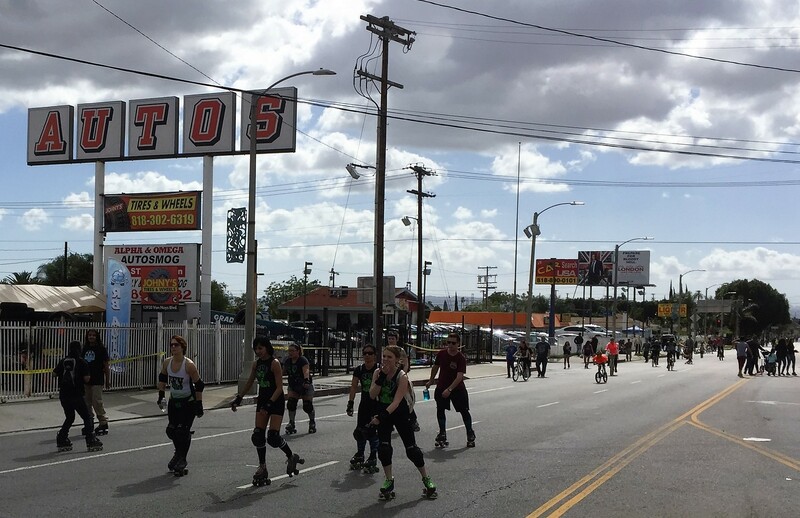 Sunday, May 1: Downey Ride & Stride Open Street Event presented by Metro. Come and explore miles of safe, fun, car-free space for walking, biking, skating, jogging, strolling and the opportunity to discover Downey. Event hours are 10 a.m. to 2 p.m. Closest Metro Station: Lakewood Metro Green Line Station. Route Length: 5.5 miles. More information here. 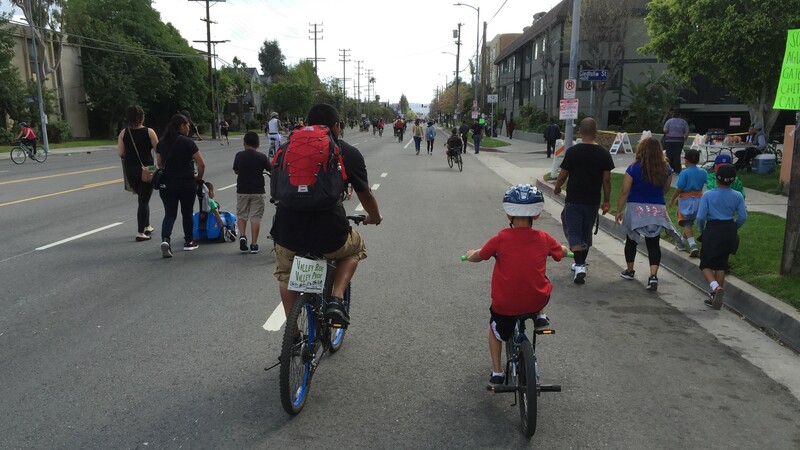 Sunday, May 15: CicLAvia: Southeast Cities. 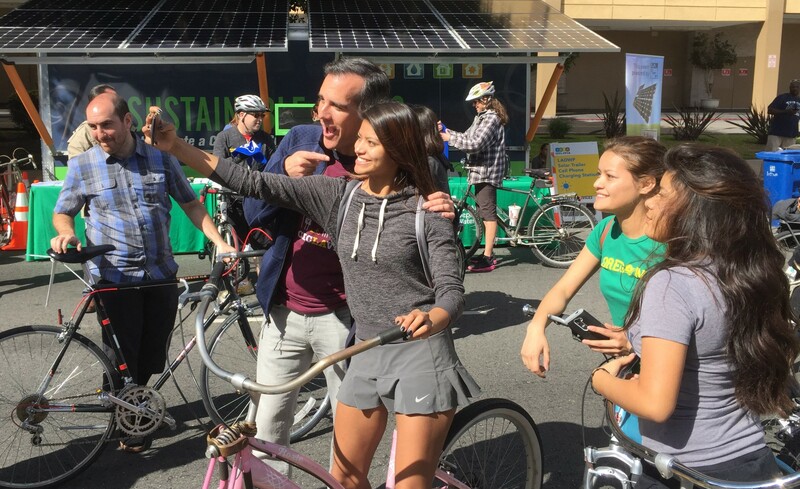 For the first time, CicLAvia will connect six communities in Southeast Los Angeles with an open streets event. 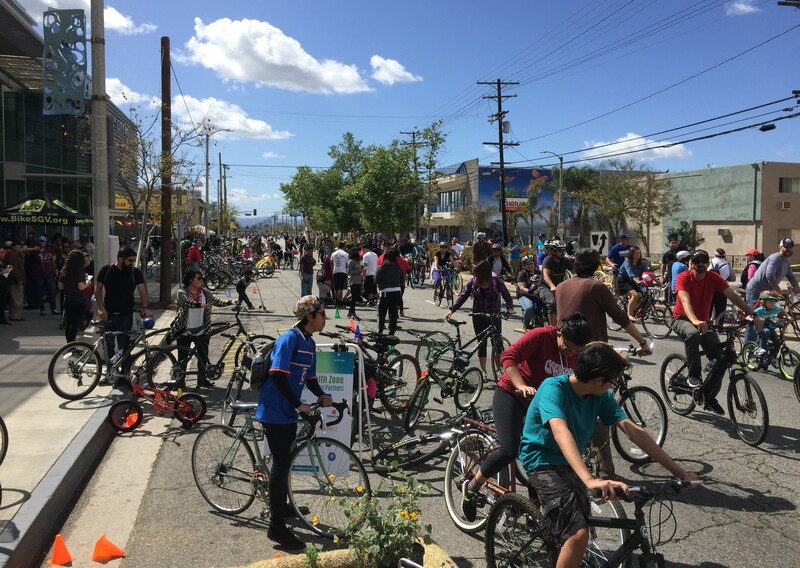 The communities of Huntington Park, Walnut Park, South Gate, Firestone, Lynwood, and Watts will host the open streets event. Streets will be closed to cars and open for cyclists, pedestrians, runners and skaters to use as a recreational space. Event Hours: 9 a.m. to 4 p.m. Closest Metro Station: 103rd Street/Watts Towers Metro Blue Line Station. Route Length: 8.58 miles. More information here. Saturday, June 4: Santa Monica Open Streets Event. Take the Expo Light Rail to the heart of Santa Monica to explore a car-free downtown by bike or foot. Breeze Bike Share is available at the Expo stop and throughout downtown. Route and event hours are 8 a.m. to 2 p.m. Closest Metro Station: Downtown Santa Monica Expo Line Station. More information here. Sunday, June 12: San Gabriel Valley Car-Free Friendly Open Street. The route was selected to incorporate the Rio Hondo River Bike Path, the El Monte Bus Station, the El Monte Metrolink station, Peck Rd. Park, and Whittier Narrows. Event Hours: 10 a.m. to 3 p.m. Closest Transit Station: El Monte Metrolink Station, Upper Rio Hondo Regional Pedestrian/Bicycle Trail . Route Length: 4.9 miles. More information here. Sunday, June 26: 626 Golden Streets Presented by Metro. Walk, Run, Skate​, Bike and Explore the 626 linking six Foothill Metro Gold Line stations and seven San Gabriel Valley cities ​from South Pasadena to Azusa. Closest Metro Station: Mission Metro Gold Line Station and Azusa Downtown. Route Length: 17+ miles. More information here. Is anyone aware of what was going on with the special Ciclavia Metrolink trains? Did anyone else try and ride Metrolink to Ciclavia? I’m curious what others’ experiences were like. Myself, I waited at Downtown Burbank station for about 45 minutes for the Van Nuys train that was supposed to have left Union Station at 10:35 am, and it never showed up. Eventually a regularly-scheduled Lancaster train passed through (at noon) and took me and the other people trying to get to Ciclavia to Sylmar Station. Metrolink customer service said the train had a mechanical problem. The whole experience made me disappointed in Metrolink for blowing an opportunity to win over some people that don’t usually ride Metrolink. I have always like riding Metrolink, but after this debacle I’d have a hard time arguing with anyone that told me Metrolink is unreliable and leaves people in the lurch. At the end of the day I took the 4:00 pm Ciclavia metrolink train from Van Nuys Station back to Union Station. That train left on time and was perfectly lovely, but there were only about 10 people that got on the train. 3-4 of them had bikes. I actually brought a skateboard to Ciclavia instead of a bike because I was concerned that these metrolink trains would be so packed with bicycles. It was disappointing to see so few people planned to take metrolink to/from Ciclavia (even if the poor service eventually proved them right not to have done so). I had pretty good time biking the route and the turnout was better than I expected, being that this Ciclavia was not connect to any rapid transit stops. On that point, I did see a lot of folks drive to this one. Panorama City hub has vast amounts of parking but I saw people parking up to a mile away where I live in the eastern half of the neighborhood (they biked the rest of the way, some of them dealing with the heavy car traffic due to the closures). In the back of my mind though was whether or not Metro or LADOT did enough to tell people that this was happening and bus routes were being diverted. I hope people got a least a week’s notice. Folks that take transit on Sundays were affected, that’s for sure. What about the Tweet from Machete? Did anyone else noticed the section of Van Nuys Blvd north of San Fernando Road that was supposed to be part of CicLAvia, wasn’t. Anyone know what happened? That would be my best guess. Maybe SCRRA balked. They did a terrible job promoting the Metrolink service. The Metrolink web site prominently promoted trips to see the swallows in San Juan Capistrano but not Ciclavia. I guess Metrolink was concerned about huge crowds overwhelming feeder lines, or the ongoing Metro-Metrolink funding dispute is chilling relations, but certainly running a train for 10 people is a waste. Weird. There was a little flooding in the south-bound lanes at the rail crossing, but other than that, nothing significant. Yeah, they said the decision was made the Tuesday before. Seemed like it ended up being an unnecessary precaution. My boyfriend drove us from my place because otherwise, it wasn’t going to happen this time. It was the first time we’ve driven to a CicLAvia and the first time we didn’t bring our bikes (but this did mean I could bring more cameras, so tradeoffs!) Parking wasn’t too bad for us at ~11:30 more towards the Pacoima end. I think we covered about half the route (essentially Pacoima end to Arleta.) I enjoyed walking CicLAvia, although I would have loved biking so I could see the whole route, but it allowed me to see more little things about the area, so it had it’s own value. People the event many people were complaining about the safety of the area, but I didn’t experience any problems, even when carrying around a pile of cameras that caught people’s attention and wandering off on my own. All of my friends that have gone to CicLAvia’s over the years skipped this one though because of the public transportation limitations combined with a rather short route & the possibility of rain.